If you have broken the screen on your PSP Go and can see dark or bright white patches on the LCD screen when turning on the unit. 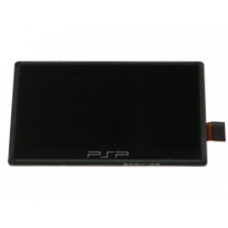 This is the replacement PSP screen part needed to restore your PlayStation Portable Go to perfect working order. Suitable for repairing the following screen display faults, dead or lazy pixels, washed out colours, cracked LCD screen. Please note that this can be a difficult home repair. * Genuine Sony Replacement PSP Screen.